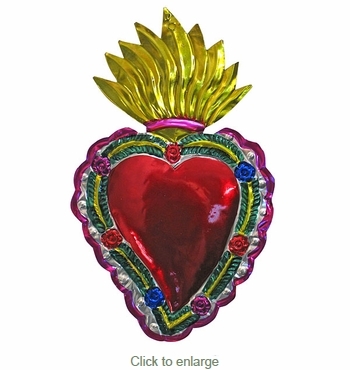 Our painted tin flaming heart ornaments are all handcrafted by metal craft folk artists in Mexico. This traditional Mexican flaming heart ornament is a wonderful way to add southwest religious spirit to your holiday decorations. The natural tin is hand cut, hand embossed and etched, then painted one piece at a time. Expect some variation in size and color with these one-of-a-kind hand crafted ornaments. Includes: 1 box of 2 ornaments. Use the quantity box for the number of boxes of 2 you would like to order.